Kim Kardashian sure knows how to make a statement when making her debut. The reality TV star, after achieving tremendous milestones in her career with the reality TV show, her KWK beauty line and much more, has now reached a new high by being featured on Vogue magazine. As the cover girl for their May issue, the diva looks super hot in a wet grunge look. Donning a slinky Chanel top with an Irene Neuwirth chain, Kim looks a lot like she shopped perhaps in the Being Human department. Well, if you remember anything about Salman Khan's fashion in the 90s and early 2000s, you'll probably see the resemblance. We're not trying to shade Kim K but just pointing out the "reality". Anyway, she went for a wet grunge look that did suit the cover really well. The picture was followed by many more stills from the photoshoot. As per her interview with Vogue, the photo shoot was conducted at her home in Hidden Hills, California. 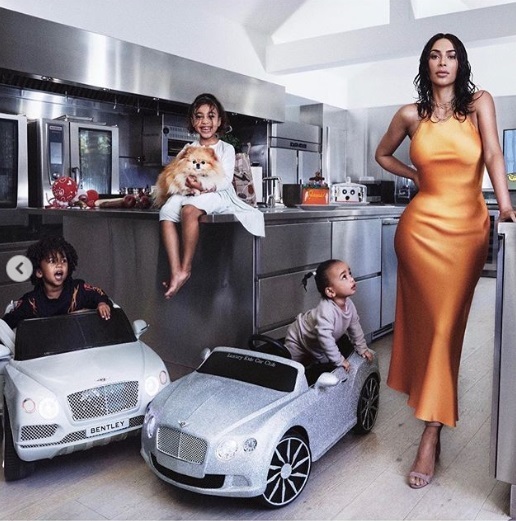 One of the pictures from the photoshoot actually has the Kardashian-West next gen! Stating how it is her debut on Vogue magazine, Kim K wrote on her Instagram, "I’ve dreamed of this moment for so long, many said it would never come. Words cannot begin to express how much of an honour it is to have my first solo US cover of @VogueMagazine. I remember as a little girl flipping through my mom’s subscription each month and dreaming of one day gracing the cover of this iconic magazine. Thank you to the incredible Anna Wintour for your support as always, it means the world to me." In her interview with Vogue, aside from talking about family, career and more, Kim also spoke about Kanye's struggles with bipolar disorder. Admitting how the family is in a better place now, Kim mentioned why West is averse to taking medication.